60 x 1000mcg Oral Colostrum-MAF™ capsules. Contains 60 x 1000mcg Oral Colostrum-MAF™. May also be used sublingually by opening the capsule in the mouth and swilling with saliva for at least 30 seconds to absorb the MAF in the mucosa of the mouth. For greater support, swallow 1 capsule orally with water first thing in the morning and take 1 capsule sublingually around bedtime each day. May also be used as an aid to beautiful skin. Store: cool, dry and closed. Long term storage: remains fully active for 1 year or longer when refrigerated. Note: The Colostrum is sourced from grass fed cows in New Zealand, and enhanced with a process to provide the active site of GcMAF. DOES NOT contain: GMO, Artificial colours, flavours, preservatives, sugar, gluten, soy, wheat, egg, rice, starch, hormones, antibiotics. Irene L. on 25/Jul/2018 Traling this product for 8yr old ASD son . Need to give this 3 months at least to guage any gains. As for service and product information Michale is on top of his game and goes above and beyond to provide you with th eright support . Customer for life . Sainthia J. on 04/Jan/2018 I just started of using this product and will let you know on the effect. Sarah-Jane A. on 25/Sep/2017 Have been taking Colostrum MAF for nearly three months but so far I haven't seen any noticeable improvements unfortunately. Claudio M. on 09/Aug/2017 i hope it will help to resolve my health problems. We recommend using UltraCur (2 caps 3 times a day) and Bosvay (2 caps 3 times a day) to support appropriate physiology. I have purchased some Colostrum Maf from you a few times and have had great results with chronic fatigue. Blas R. on 15/Jun/2017 great and effective product. More energy , less bloated. have been struggling with chronic fatigue syndrome for a while . this is helping ! This treatment is working for me which I am very thankful. I do wish it wasn't so expensive however. Helene L. on 05/Nov/2016 The combination of these supplements plus BRAVO boosted my white blood cell counts after 2 weeks. The pills are also tiny and very easy to swallow. Heidi H. on 12/Aug/2016 I have had symptoms of chronic fatigue for 25 years and have had to work very hard to maintain some health. Now with the MAF, I am feeling better than I have in years and have stopped most of my supplements that kept me going and am feeling better than ever. I am also seeing this with my patients. Development of colostrum MAF and its clinical application. Haruka Amitani, Robert A Sloan, Nanami Sameshima, Koichi Yoneda, Marie Amitani, Akinori Morinaga, Yoshihiro Uto, Toshio Inui, Akio Inui, Akihiro Asakawa. Oral Colostrum Macrophage-activating Factor for Serious Infection and Chronic Fatigue Syndrome: Three Case Reports. Inui, Kubo, Kuchiike, Uto, Nishikata, Sakamoto, Mette. 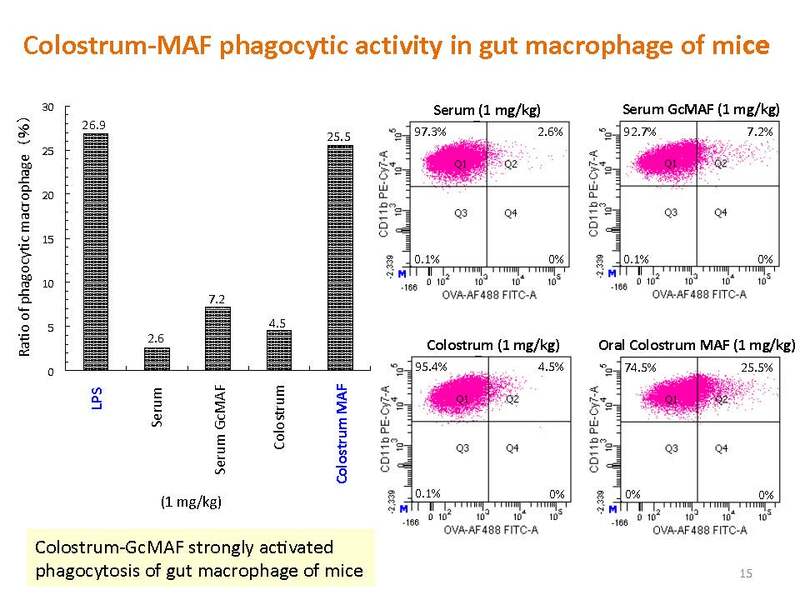 Degalactosylated/Desialylated Bovine Colostrum Induces Macrophage Phagocytic Activity Independently of Inflammatory Cytokine Production. Uto, Kawai, Sasaki, Hamada, Yamada, Kuchiike, Kubo, Inui, Mette, Tokunaga, Hayakawa, Go, Oosaki.